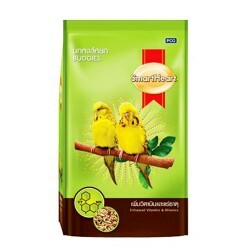 Product Information-Smart Heart offers a complete diet to support all essential health needs of Budgies and other related species. Balanced proportions of protein, fat, carbohydrates, fibers, vitamins and minerals promise to give optimum nourishment for complete well-being. The high-quality bird food is fortified with vitamins and minerals which are essential for proper management of health. Vitamin A enhances the vision while omega 3 and omega 6 fatty acids work to improve the functioning of brain. The health of reproductive system gets a boost with the addition of vitamin E. Kibbles have been created through the process of extrusion that makes them highly digestible and palatable.